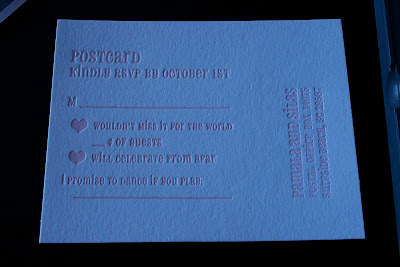 As I mentioned in my last post, I planned to letterpress our entire invitation suite this past week. 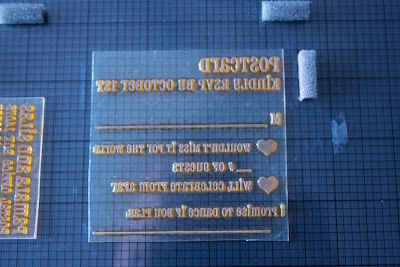 First, I letter-pressed the actual invitation, and then I cut the remaining paper down to "postcard size" for the RSVP's. (I didn't order the regular A2 size for the postcards, because I wanted to use the excess from the A7 paper for the hanging tags we're doing with accommodation information). In my paper orders, they've also included 10 small note cards, in A2 size, so I already had 20 of those size, and just needed to cut 35 more. I did that, and set up the plates. That's when I realized my error. I had designed the postcard for a 4x6 card. 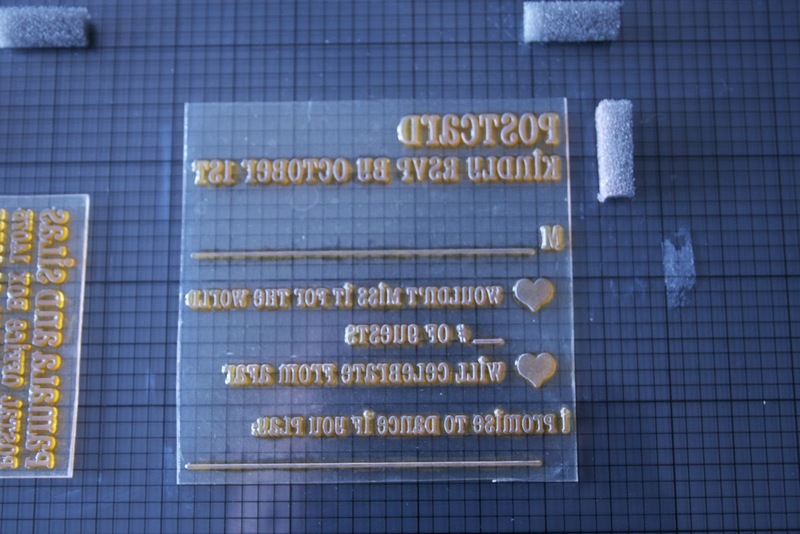 The A2 size is 4.25 x 5.5, meaning I had a half of an inch less of horizontal space. Our address would not fit at all, without looking extremely scrunched. That's when I decided that I'd just make the address "vertical". I finished all 55 of them, and felt very pleased with myself. Not only did I have my standard postcard size, but the letterpress came out great. This morning, we went out to the post office, to ensure that I could order the right postage for them, and I wouldn't be stuck with the Hawaiian shirt postage for postcards that we had to use on our Save the Dates. The first post office I went to told me that not only were they non-machinable, but they were too thick, and they'd cost me 90 cents in postage, 65 cents if I bought 55. I thought that was a little fishy, so I took them to a second post office - the post office where we have our PO box. This post office told me they were not too thick, but definitely non-machinable, and that I'd need to put the postage overtop of the area that says "Postcard". I was incredibly upset by all of this, I'll admit. Si and I took a drive and talked about options, which included: (1) try to send one as is, and see if it reaches us, (2) put the exisiting RSVP's in envelopes and send them for 45 cents, or (3) redo all 55 RSVP's. 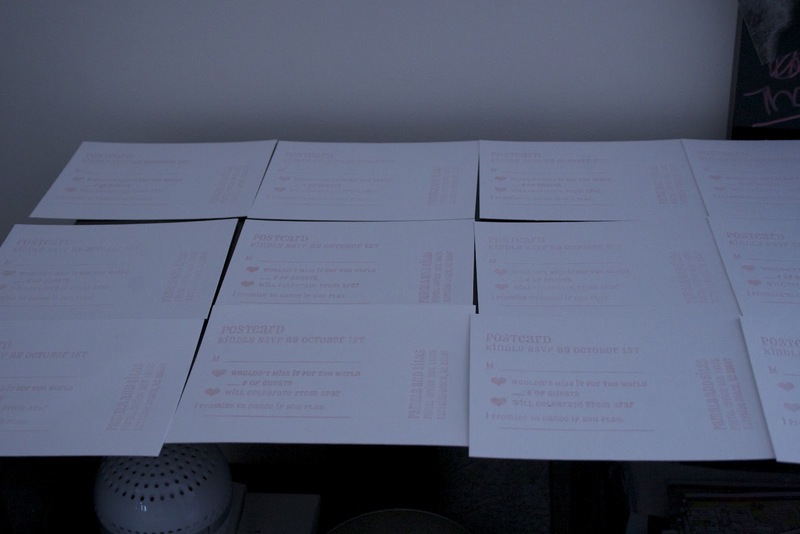 In the end, I really wanted to keep the sweet vibe of our RSVP's, and send them via postcard, so we decided to redo them all. As tempting as it is to just try it and see what happens, it's not really the route we wanted to take with the RSVP's for our wedding. Did you have any major hiccups in your invitation process? How crazy is it that multiple post offices can tell you completely different things? ?